Fresh violence erupted in London tonight. Fresh violence has flared around the UK tonight as police in London admitted they were prepared to use plastic bullets against rioters if a fourth night of lawlessness continues. Pockets of unrest have been reported in the West Midlands and Manchester as an ‘unprecedented’ 16,000 police officers were sent to patrol the streets of London following questions over the failure of police to bring last night’s riots under control. 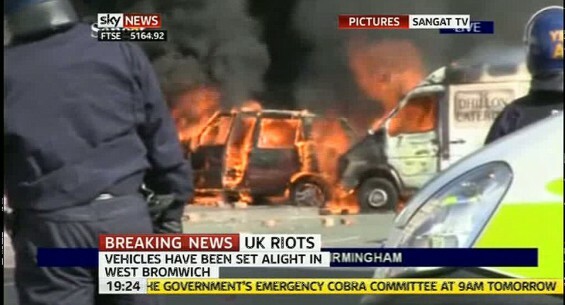 Sporadic disorder and looting has been reported in Birmingham, Wolverhampton, West Bromwich, Greater Manchester and Salford, where the Central Housing office is on fire.